We are expecting our third child! I'm deathly ill. I spent 3 weeks on the couch. Moaning. I'm so glad Troy has a job that allows him to work from home so he can take care of the girls, (and me). Oh, and I get to pack up my house, clean it from top to bottom, and move across the country in 3 weeks. Now, this is also our last child. How can I be so sure? Well, barring a miracle, that is, I can be sure. I have infertility, and tried for 5 years to get pregnant before being blessed with our first daughter. We did IVF to get pregnant with her. 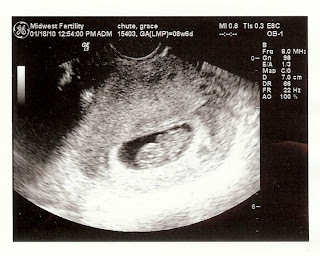 Our second is a result of a frozen transfer from the IVF. And, this baby is the last of our embryos. So, that's how I can be so sure. Those of my friends dealing with IF, I hope this doesn't hurt you too much. I know it's going to hurt a bit - a lot, that's inevitable. Know that I have my fingers crossed for you and your miracles, too! Oh, I am feeling a little bit better. I am just so nauseas all day long, and exhausted, but I am better than I was 3 weeks ago, so says Troy. Awwww, how exciting! Will you find out the gender? Congrats! I hope it's okay that I ask, but how many embryos did you transfer each time? Do you know their grades at all? Congratulations!!!!! That is exciting...ok not the nauseous part...yea for a new baby chute! Good luck with the packing and cleaning. If I was closer I would come help you out. As one of your friends with IF, I have to say that I am not hurt but so happy for you. You have been a HUGE help on the bumpy IF road. Whenever I would get depressed or upset, I knew I could call or email you and you would calm me down and remind me that there was still hope. I thank you for your encouragement, support, friendship and most of all HOPE. Thank you. Also, I have a cure for the nausea. Try peppermint tea, it works for nausea, diarrhea and most of all is a natural DESTRESSER. Since it is naturally decaffinated you should have no problems.